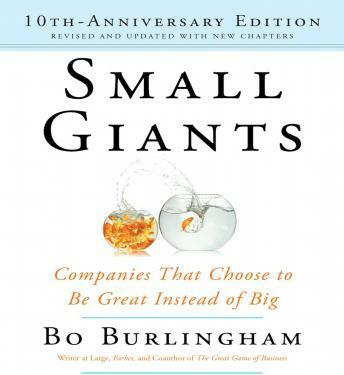 In Small Giants, veteran journalist Bo Burlingham takes us deep inside fourteen remarkable companies that have chosen to march to their own drummer. They include Anchor Brewing, the original microbrewer; CitiStorage Inc., the premier independent records-storage business; Clif Bar & Co., maker of organic energy bars and other nutrition foods; Righteous Babe Records, the record company founded by singer-songwriter Ani DiFranco; Union Square Hospitality Group, the company of restaurateur Danny Meyer; and Zingerman's Community of Businesses, including the world-famous Zingerman's Deli of Ann Arbor. Burlingham shows how the leaders of these small giants recognized the full range of choices they had about the type of company they could create. And he shows how we can all benefit by questioning the usual definitions of business success. In his new afterward, Burlingham reflects on the similarities and learning lessons from the small giants he covers in the audiobook.